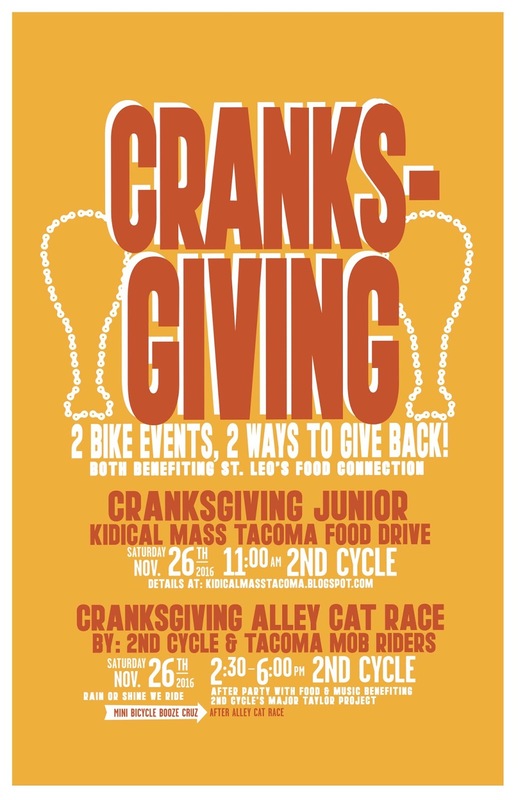 Join us for our 2nd Annual Cranksgiving Junior family bike ride through Hilltop on Saturday November 26, 2016, at 11 a.m. from 2nd Cycle Community Cycle Center (1213 MLK Jr Way). We'll pedal to a park for some play time then pedal to the Hilltop Safeway for a chance to try your hand at family shopping by bicycle. Riders will be asked to purchase a few items from a given list that will be donated to the Backpack Program at St. Leo Food Connection. 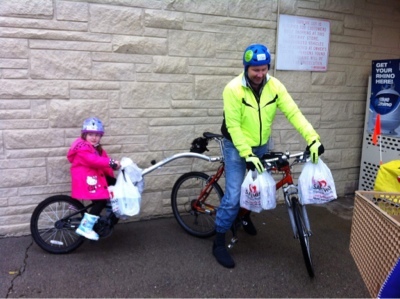 Be sure to bring along some way to haul your food items with you on your bike - a bag, a basket, a trailer, etc. 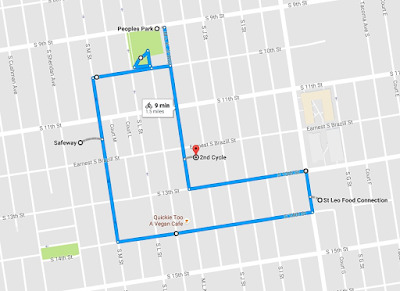 After we shop, we'll pedal to the Food Connection to deliver our items and take a quick tour. Cash donations to the Backpack Program will also be accepted and are used to purchase fresh produce. You can also donate directly through their website. As always, we will be riding in the street and following the Rules of the Road. For this ride, younger riders with push bikes or training wheels can ride directly to Safeway along the sidewalk. All children must be accompanied by an adult. Thanks to the Tacoma Wheelmen's Bicycle Club for sponsoring our events. BONUS RIDE! 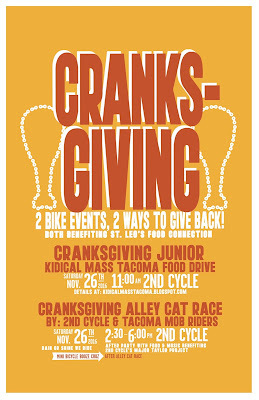 There will also be an afternoon alley cat-style Cranksgiving event starting from 2nd Cycle on the same day! More of a grown-up ride, but also helping hungry Tacomans.